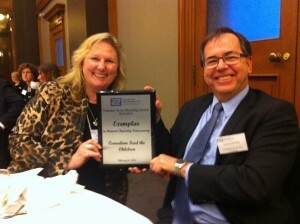 President & CEO Debra Kerby and Board Chair Derek Briffett proudly display the VSRA Exemplar plaque, awarded upon CFTC’s third win. 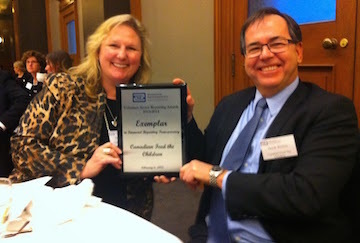 Toronto, Feb. 11, 2015—Canadian Feed The Children (CFTC) is thrilled to announce it has received its third consecutive Voluntary Sector Reporting (VSR) Award for Excellence in Financial Reporting Transparency in the category of International Focused Organizations for its 2013 Annual Report, Perspectives on the Way to Change. The third win earns CFTC “Exemplar” status, and represents a significant milestone in the organization’s transition, begun in 2010, from a traditional charity to an international development agent of change. In 2013, CFTC became one of the first non-profits to be accredited by Imagine Canada under the rigorous Standards Program, and also that year earned the largest grant in its history from the Department of Foreign Affairs, Trade & Development (DFATD) to implement an agricultural training program which is currently supporting 400,000 smallholder farmers in Northern Ghana to achieve greater food security in the face of climate change. In presenting the award, Carol Wilding, FCPA, FCA, President & CEO of Chartered Professional Accountants of Ontario (CPA Ontario), noted that exemplar status is conferred only upon “the best of the best.” Organized by the CPA-Queen’s Centre for Governance in partnership with CPA Ontario and now in its seventh year, just six organizations including CFTC have been named as VSR Award exemplars. Read CFTC’s 2013 Annual Report, Perspectives on the Way to Change. The Standards Program Trustmark is a mark of Imagine Canada used under licence by Canadian Feed The Children.